Strawberries are the first fruit after rhubarb to ripen in spring and early summer. They are the siren call of early-season farmers markets in warmer and temperate climates, harkening people to market before that day's supply runs out. Perfectly ripe strawberries are best eaten out of hand, of course, but they also make great additions to salads and plenty of desserts. When strawberries are in season it is important to know what to look for, the different varieties, and how to store them. And, if you are lucky enough to have a farm nearby, you'll need to get tips on how to pick strawberries. Strawberries are the most cultivated berry in the country. They are grown in every state and are available at most farmers markets, if only for a brief time in colder climates. 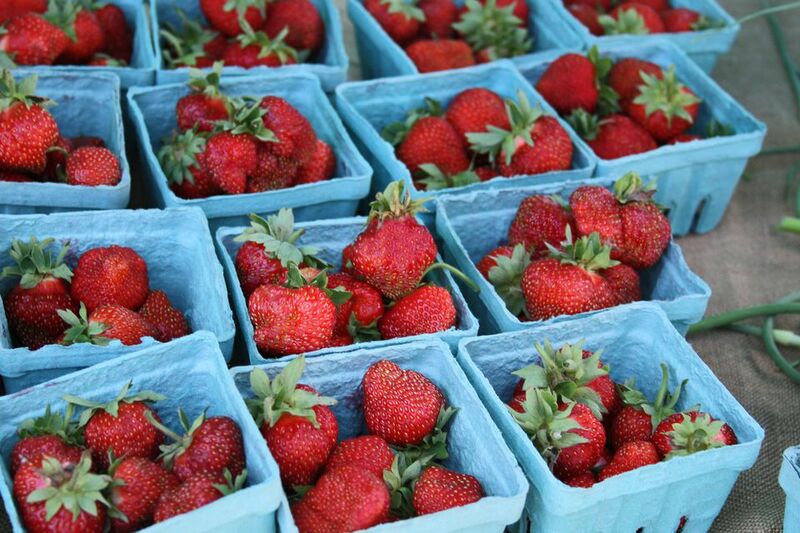 Nothing beats fresh, local berries. That said, most commercial strawberries in the U.S. are grown in California or Florida, where, with the help of new varieties, the strawberry growing season runs from January through November. The peak season—some might call it the more natural season—is April through June. Other areas of the country have shorter growing seasons that range from five months to as short as a few weeks in July in the coldest areas. Some 600 strawberry varieties are grown in the U.S., from Allstar to Seascape. If you find different varieties at your local farmers market, you may be surprised by how varied they are in shape, color, and taste. Typically, the smaller the berry, the greater the intensity of flavor; large berries tend to have more water and a slightly diluted flavor. Whether at the supermarket or farm stand, you need to look for certain things when buying strawberries. Choose brightly colored, shiny berries that are dry, firm, and plump. They should still have fresh-looking green caps attached. Avoid soft, dull looking, or shriveled berries. Since strawberries do not ripen after being picked, avoid berries that are partly white as that means they are unripe. It may seem obvious to say, but strawberries should smell like strawberries. Take a whiff before you buy. When you bring the fruit home from the market, store the strawberries in a moisture-proof container, preferably in a single layer on a paper towel, in the refrigerator for 2 to 3 days. Like most fresh fruits and vegetables, you do not want to rinse the strawberries until you're ready to use them. 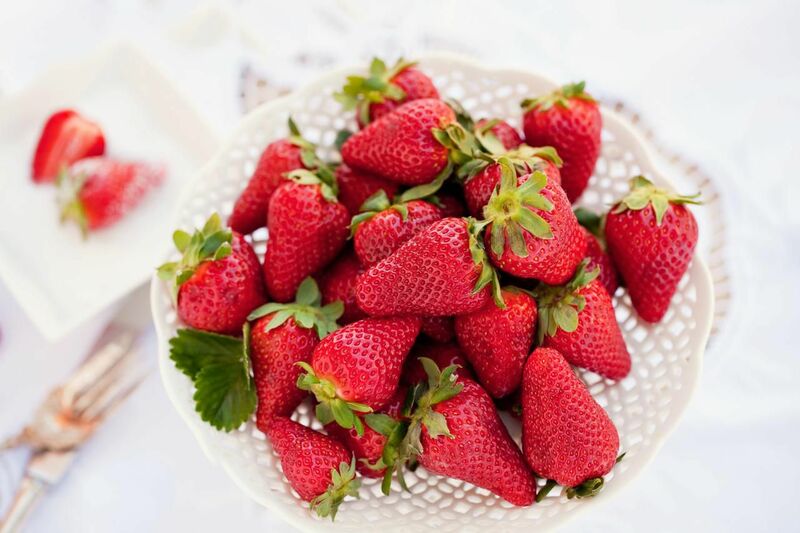 To wash strawberries, place them in a large colander and rinse gently with cool water. Lay strawberries in a single layer on a clean kitchen towel or layer of paper towels and pat dry. You should also wait to hull the berries until it is time to eat or use them in a recipe. Unless you're eating strawberries out of hand, you need to hull them. Hulling a strawberry means removing the inedible green caps from the fruit. To do this, place the tip of your knife at the base of the cap, insert gently to remove only the soft white part at the base of the stem and slowly turn the strawberry. Once you come full circle, the top will pop right off without sacrificing too much flesh. If you like specialty kitchen gadgets, you can also use a strawberry huller, but a simple paring knife works just fine. Get the freshest strawberries possible by growing—or at least picking—them yourself. And if you're going to grow them, you might want to consider going organic. If you decide to visit a farm where you can pick your own strawberries, be sure to wear sunscreen and a hat, bring vessels for bringing the berries home, and be prepared to freeze a few. It is so disappointing to find your fresh, beautiful berries have started to rot and you have to toss them out. Avoid wasting this treasured fruit by freezing. Freezing your strawberries is easy; just hull them, lay them in a single layer on a baking sheet, and freeze them until they're solid (overnight usually does it). Then transfer them to a resealable plastic storage bag and keep them frozen until ready to use. Frozen strawberries will keep up to six months (even a year in a stand-alone freezer with reliable temperature control). Perfectly ripe strawberries are best eaten out of hand. If you're willing to put in just a tad more effort, there are many other simple ways to enjoy this fruit. You can pour a bit of heavy cream over strawberries and then sprinkle with sugar to taste or drizzle strawberries with a good-quality balsamic vinegar (the sweet and tangy actually complement each other). Of course, you can dip strawberries in chocolate, but consider trying them dunked in sour cream or plain yogurt and then into a bit of brown sugar. Combine strawberries with other berries, cut up melon, and tropical fruits in a fresh fruit salad, or add strawberries to a simple tossed green salad (think of them as sweeter tomatoes!). For an easy fresh strawberry sauce, just slice and sprinkle the berries with sugar. As delicious as they are when eaten fresh, strawberries are also wonderful when cooked. As we know, this berry is great in tarts and pies, but they also add sweetness and flavor to savory dishes, like a strawberry chicken salad with champagne vinaigrette. You can also enjoy strawberries in a beverage, like when blended into a strawberry almond smoothie or in a springtime sangria. For a real treat, try strawberry ricotta muffins, which are tender, sweet, and addictive, or, a strawberry shortcake French toast casserole. As if great taste weren't enough, strawberries are also good for you. In addition to being low in calories and saturated fat, strawberries also contain plenty of antioxidants and vitamin C. They are a good source of fiber and are low in sugar.